Consensus Committee Application now available online (link below) - applications accepted through April 15, 2019. Proposed Changes Submission Form now available online (link below) - change proposals accepted through May 7, 2019. This is the general log of information on the 2019 Review and Update process for Square Footage - Method for Calculating ANSI Z765 including schedules, committee meeting notices, agendas and minutes, public comments report, draft documents, committee roster, etc. Questions or comments on the development process? Contact us. 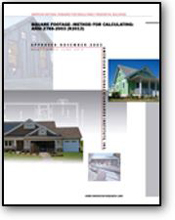 Buy your copy of Square Footage-Method for Calculating: ANSI Z765.